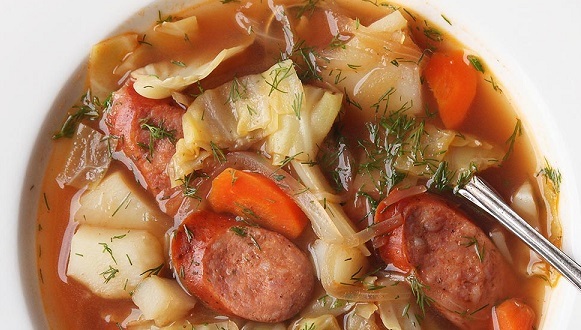 Pressure Cooker Bacon Lover’s Stew: Bacon, Sausage, Potato, Onion and Cabbage! Pressure Cooker Recipes. BONUS: Augustine on Bacon! But first, If you will let me wax poetical for a moment before we get to the actual recipe, I’d like to present an ode to a surprisingly useful kitchen tool. The modern pressure cooker is an amazing thing, and makes amazing food. If you haven’t bought an Instant Pot, or something like it yet, it’s time to really consider it. I love making soups and stews, and you can make excellent soups and stews (and hundreds of other things) in literally half to one third of the cooking time compared with other conventional methods. It is not only quicker and more convenient to cook in a pressure cooker, but it also tastes better! Check out this Serious Eats column for the science of the matter – it helped convince me to invest in an Instant Pot. 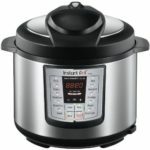 By the way, after hours of shopping and reading reviews, I came to the conclusion that the Instant Pot was the best and easiest pressure cooker to use – it has excellent reviews, and so far works great. Just be sure to get the right size for your family! A six quart Instant Pot is almost too small for our family of seven – I find myself wishing I had spent the extra money for an 8 quart, so that there would be more yummy leftovers. 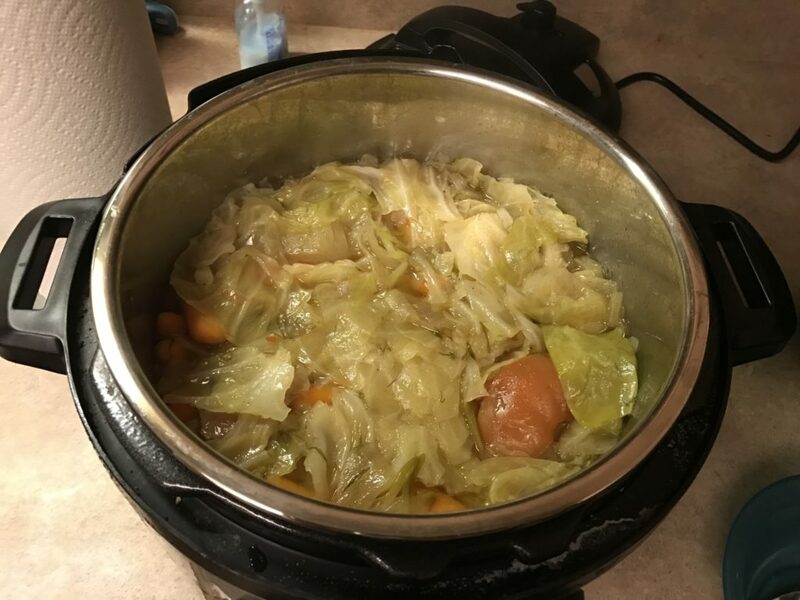 The Humble Instant Pot – click here to see Amazon’s page on it. Cooking the bacon and sausage. On top of the layers of vegetables, add dill, paprika, pepper, bay leaves and salt, if desired, keeping in mind the sodium content of your chicken stock. Don’t forget to remove ALL bay leaves before serving. Layer torn cabbage leaves on top of everything else – right up to the fill line on your pressure cooker. Press down all of the vegetables, and add chicken stock until your pot is filled up to the fill line. You will likely be able to add more than you think, as the stock will go into empty spaces around the vegetables. I was able to add all 32 ounces, and still keep the food under my Instant Pot’s fill line. Seal your pressure cooker properly – check and recheck this to make sure it is sealed, and your pressure release valve is set properly. Cook on manual (high pressure) for about 20 minutes. Remember that 20 minutes is the cooking time at high pressure – allow a couple of minutes for your cooker to get to high pressure. After 20 minutes of cooking, release your pressure valve (read the manual! 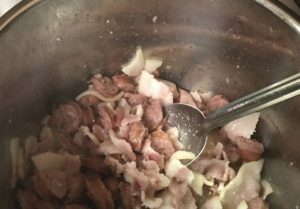 ), and when the pressure is all gone, open the pot and use the edge of your stirring spoon to cut up and separate the tender, large vegetables that you didn’t slice up earlier. They should cut up quite easily. Serve and enjoy! The finished product. If I was a REAL food blogger, I’d probably add more colorful veggies for the picture, but I’m in it for the taste – not the looks! Prep Time: 10-15 minutes. Cook Time: 20 minutes. (plus pressurizing) You can be eating less than 40 minutes after starting to cook! *Honest confession: The picture at the very top is NOT this exact recipe – you might notice the bacon is missing. By the time the stew was ready, the whole family was so hungry and stirred up by the smell, that we ate it before I could take a good picture of it in the bowl. Alas. Please do not report me to the food blogger authorities – I’m just a mere theology writer who aspires to culinary greatness. BONUS: Augustine was an early church father who lived in the 400s A.D. In the quote below, he is challenging the religious convictions of the Manichaeans, who taught that eating meat, especially bacon, was sinful. Augustine disagreed. Source: Augustine of Hippo, The Catholic and Manichaean Ways of Life, ed. Roy Joseph Deferrari, trans. Donald A. Gallagher and Idella J. Gallagher, vol. 56, The Fathers of the Church (Washington, DC: The Catholic University of America Press, 1966), 93.